You can tell a lot about a person by his or her workspace. A messy desk isn’ t a guarantor of a messy mind, but it’s not a great start. A rigorously sorted pegboard isn’t an infallible sign that a carpenter knows the business, but it beats a bucket of chipped chisels. Our personalities are inscribed on our tools just like our fingerprints, whether the tool is a sharpening wheel, an oyster knife or a keyboard. The things we keep around us at work also tell our stories. In some ways the contents of our desk drawers are more revealing than the art on our living room walls or the books on our coffee tables. There is time at home to edit the statement the good china makes about us, but at work, where utilitarian concerns take precedence, our objects hold forth with unedited candor. We visited a writer, a knife sharpener and an oyster farmer to find out what their workspaces could tell us. The journey was revealing and instructive. 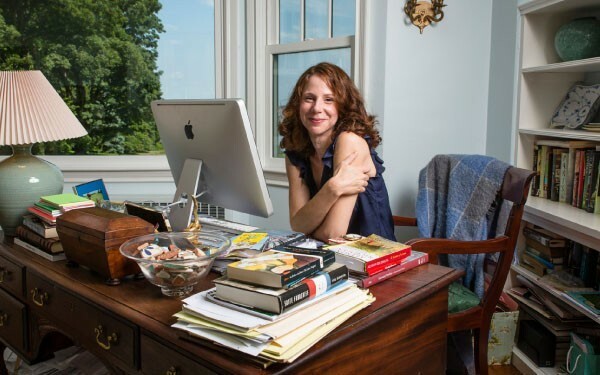 Alyson Richman, bestselling author of The Mask Carver’s Son, The Rhythm of Memory, The Last Van Gogh and The Lost Wife, writes in Huntington Bay. Long Island Pulse: Is that a partner desk for two people to share from opposite sides? Alyson Richman: It is. It came from New Orleans and I bought it from a female lawyer in New York City. I was attracted to it because of the storage. The things on my side are my tools of the trade: Pads, pens, zipdrives. On the other side are things I don’t need every day like contracts and royalty statements. I’ve written four novels on that desk. Pulse: Cool. What’s in that bowl? 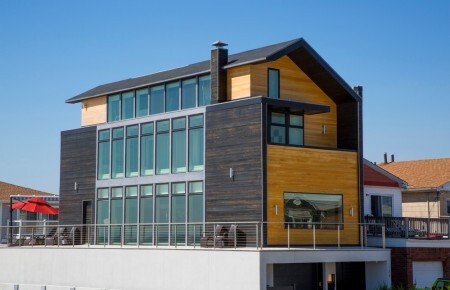 Is that sea ceramic? AR: Yes. 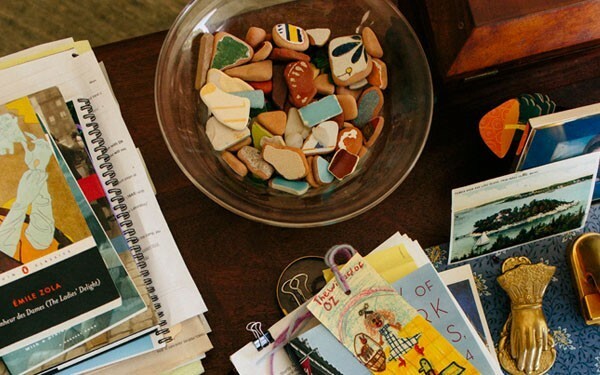 It’s like sea glass, but they’re pieces of pottery. I collected those one summer when I rented a house on the Amalfi Coast. 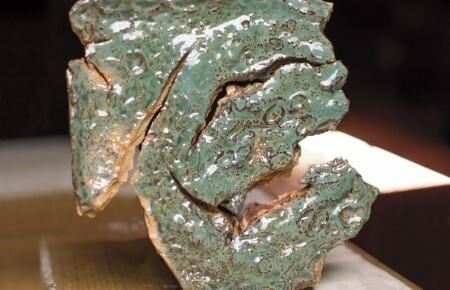 I wrote my second book there and there was a ceramic factory near the beach where the pieces would wash ashore. I can pick up any one of those pieces when I’m stressed and it relaxes me. Pulse: What about the wooden box next to the bowl? AR: That’s an antique writing box. Inside is an inkwell. I have several of them and they belonged to my late mother-in-law who collected them. She was an editor of textbooks and she wanted to be a writer. Pulse: How about the blanket? Is that an heirloom? AR: Purely practical. I’m always moving around. I started scraping all the paint off that wall behind me, so I put the blanket on the chair to protect the wall. Pulse: What about the pocket watch? Do you have a set amount of time that you have to write? AR: I write for about four hours a day, but that pocket watch doesn’t actually work. It’s over 100 years old and I broke it when I was 12. I cracked the glass and my mother was very upset with me. I keep it to remind me that things that are broken still have some use. There’s probably a section in every one of my books that talks about the beauty of clockwork. I like to pick the watch up and touch the dial, which is sort of forbidden. 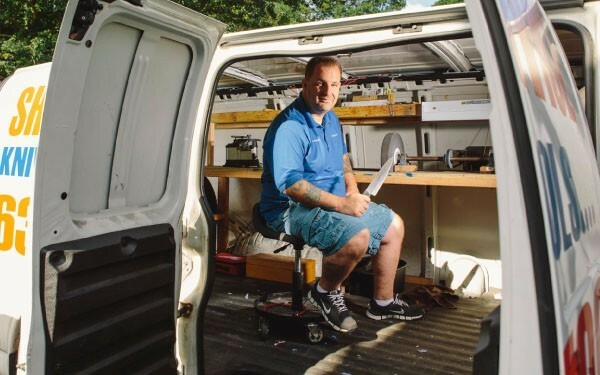 Richard DeVito operates Sunrise Sharpening, a mobile operation based out of West Babylon. Long Island Pulse: This might be a touchy subject, but you’re a guy sitting alone in a van with a bunch of knives. Do you ever freak people out? Richard DeVito: Never. No. I think with all the lettering on the van it’s pretty clear what I’m doing. Pulse: How did you get into the blade business? RD: When I was 12 or 13 my grandfather had a store in Manhattan, so I got into it that way. Now I’m 43 and I’ve been doing this 30 years. Pulse: The operation is simpler than you’d imagine. It seems like you’d need more machines and tools. RD: I have other pieces of machinery back in my shop that I can bring around if someone needs them. Equipment for lawn mower blades and things like that, but yes, it’s pretty simple. I have an electric motor that connects to the van’s battery and I run the machines off that. Pulse: Are those spinning wheels kind of hypnotic? RD: In a way. I enjoy doing it, 100 percent. 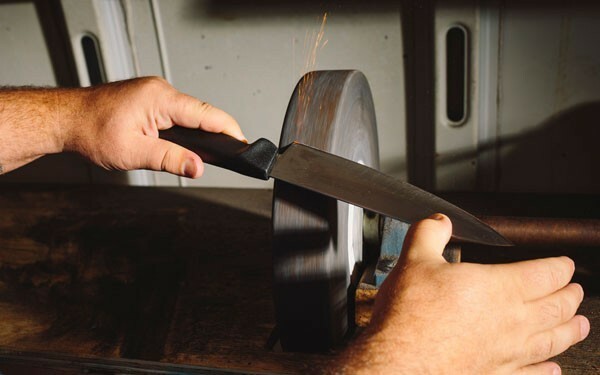 I find putting a really good edge on a blade very satisfying. When I get a pair of scissors or a knife I test it on a variety of materials and they’re usually very dull. A piece of paper will just bend in half. Then, when I get done, it’s like a hot knife through butter. Pulse: Are you so good at this point that you don’t cut yourself? RD: Oh no. There’s a first aid kit in there. I get cut every week. It’s not usually anything crazy, but I get nicked all the time. 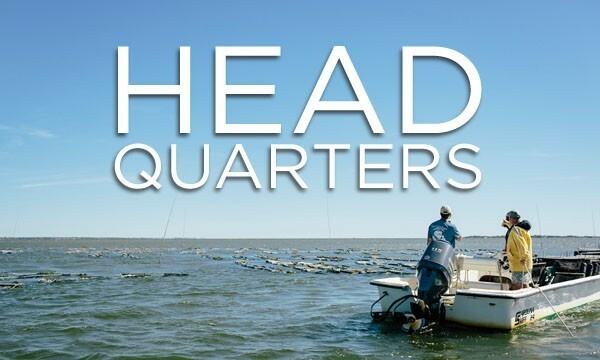 Family members Mike, Doug and Kerry Winter, along with partner Rick German, started Long Island Blue Point Oyster as a way to spend more time on the water. Now they’ve got a bustling business on their hands. Long Island Pulse: This is obviously a very hands-on operation. How many people make up your crew? Mike Winter: There are four partners. All of us grew up on the water and we all have a passion for the Great South Bay. The restaurants love our oysters. 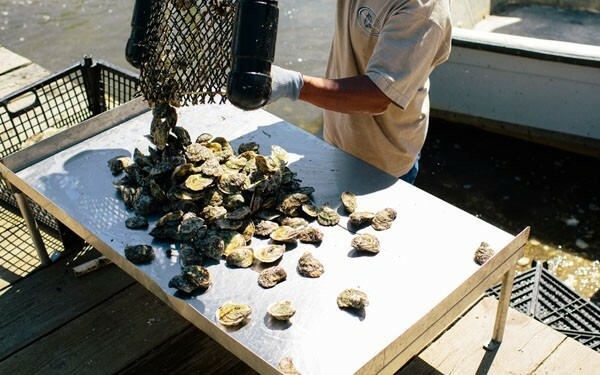 If we had a million oysters today, we’d sell a million oysters tomorrow. Pulse: How many oysters do you have? MW: We sell about 20 or 30 boxes a week and each box contains 125 oysters. We can’t produce more than that right now. We actually all have full-time jobs. I’m a marina manager and we also have an accountant, a stockbroker and a project manager. Pulse: Are you out there in the winter as well as the summer? MW: It’s year-round. In the winter we just shovel the docks and do the same thing. Depending on the tide we’re sometimes working in chest-deep water. When it’s cold it can be pretty punishing. 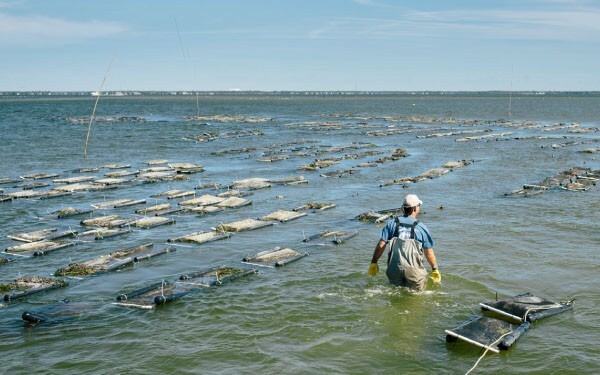 Pulse: How does oyster farming work? MW: We get the seed oysters from the Islip Shellfish Hatchery and then we put them out on the farm. You manicure the oysters by flipping them over to break up the shell. It’s like when you cut your hair and the hair grows back thicker, we want our oysters to have a thick shell and a nice, deep cup. That’s what makes our oysters so sought after: They’re nice and plump with a deep shell cup. Pulse: Do the oysters grow on the bay bottom? MW: No. We use an off-bottom floating system of aquaculture. Our oysters are always in the tidal flow, which allows them to grow faster. They eat more and grow larger because they don’t have to filter out the dirt and mud. A wild oyster will tend to be more brittle and flat, but we individually pick ours over and groom each one.